Contributing & Participating Helps Our Academy Help You!! Why Support Your PAC? 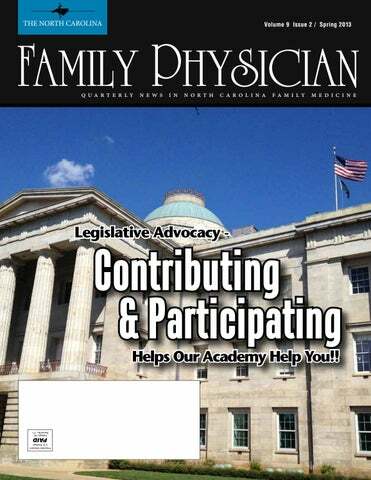 FAMPAC contributions support legislators whose business, legal, and medical philosophy is consistent with those of the NCAFP and Family Medicine. Our specialty’s interests are more likely to receive greater attention among the many competing interests and proposals under consideration. ACT NOW Sign Our Petition Supporting Greater Physician Involvement in Medicaid Reform!!! practice laws or state funding for tobacco cessation efforts, we need your help in making our collective voice heard. That voice can be extremely powerful, but only through the strength of our 3,300 combined members. So next time you get an e-mail from the Academy, make the call, write a letter or even go see your local elected official. We’ll help you with the messaging, but it’s up to you to make the contact. Keep the voice of family medicine strong, Take Action! ne of the million dollar questions in residency education today is how best to train family physicians for the everincreasing variety of demands they will face in community practice. With family physicians serving more clinicallydemanding patients in environments as varied as solo practices to community health centers, it is a huge challenge. *	Dividend	payments	are	declared	at	the	discretion	of	the	MAG	Mutual	Insurance	Company	Board	of	Directors. Since	inception,	MAG	Mutual	Insurance	Company	has	distributed	more	than	$108	million	in	dividends	to	our	policyholders. Insurance	products	and	services	are	issued	and	underwritten	by	MAG	Mutual	Insurance	Company	and	its	affiliates. www.ncafp.com/msfmd GO’IN GREEN!! All Mid-Summer Meeting syallabus and educational materials will be provided as a download. CME Workshops will be provided at no charge. Please be sure to purchase and reserve your paper syllabus when you register. There will be limited copies available for purchase on site. Hotel Accommodations Begin making your hotel reservations by contacting the Embassy Suites Hotel at Kingston Plantation and mention the North Carolina Academy of Family Physicians in order to receive the discounted room rate. Room rates in the Embassy Suites Hotel for Saturday, June 29 through Saturday July 6, 2013 are $235 per night plus tax. A variety of Condos and Villas are also available and range in price from $235 to $429 per night depending on size and location. Please call 800-Embassy or 800-876-0010 for more details and to make your reservations. The Kingston Plantation and Embassy Suites Resort is located at 9800 Queensway Boulevard, Myrtle Beach, SC 29572. Complete conference and Symposium information, along with online registration, is available at www.ncafp.com/msfmd. Registration rates offer great flexibility and package savings. If you have any questions, please contact Marietta Ellis, Director of CME or Kathryn Atkinson, Manager, Meetings & Events, at 919-833-2110 or (800) 872-9482 (NC Only) via e-mail at mellis@ ncafp.com or katkinson@ncafp.com. We look forward to seeing you in Myrtle Beach. In related news, ten of the twelve original students selected as Family Medicine Scholars in 2010 participated in the MATCH in March. Five selected Family Medicine as their specialty of choice while three others are helping to fill primary care or other areas of need in NC: Psychiatry, Med-Peds and Obstetrics. In addition to the Scholars component of this program, the Interest component continues to impact students as well. Membership is at an alltime high with 569 total student members at this writing. Over 100 students attended the Annual Meeting in December and student interest in Advocacy and other Academy activities is on the rise as well. Externship Program Gears up for Summer The NCAFP Foundation was able to offer numerous Externship experiences to students for the coming summer. In addition, through a partnership with MAHEC Hendersonville, one of North Carolina’s rural track residency programs, another 10 students will participate in the exciting Rural Health Experience program. This is the second year it has been offered to students and interest continues to grow. Students in all programs are in the process of being matched with a preceptor for their summer experience. CABBARUS continued from p. 9 alongside resident physicians in the office and at the hospital. “With our model of care, our faculty remain actively engaged in day-to-day patient care such that they’re closer to what the residents are experiencing and are better able to help them,” noted Dr. Erika Steinbacher. Steinbacher went on to highlight how this helps in mentoring, team building and overall clinical care. The residents are treated as junior partners by faculty and staff in a true apprenticeship model. The Center of a Tight-Knit Medical Community Cabarrus Residency Director Mark Robinson, MD. Cabarrus Family Medicine Residency is situated in the virtual center of a close-knit medical community in Cabarrus County. CMC-NorthEast, the program’s primary in-patient site and the county’s only hospital, serves as a referral hub for patients and area physicians. Drawing from a large catchment area, CMC-NorthEast provides widely varied complex clinical experiences to trainees of many types of stages. Cabarrus Family Medicine residents operate unopposed at CMC-NorthEast and staff a busy in-patient family medicine service that accounts for more than 30% of all hospital admissions. As the only residents at CMC-NE, Cabarrus residents have the opportunity to work side-by-side with attendings from a range of specialties and helps them to create connections within the medical community. “There’s definitely not the common hierarchy of the attending and the resident here. It’s more like ‘we are your colleagues,’ noted Mary Catherine Moree, MD, a third-year resident who will graduate next month. She went on to describe how residents are routinely involved in complex cases and often asked for direct clinical input. “It feels like an equal playing field and helps you learn and feel part of the community.” In addition to direct patient care, Cabarrus Family Medicine physicians and advanced care practitioners are often key leaders in important community health initiatives and participate in everything from the local Chamber, to the hospital’s executive committees and key medical staff leadership positions, including CMC-NE’s Chief of the Medical Staff. Residents are encouraged to participate in these types efforts as time allows, including volunteering at the local free clinic, joining the practice’s annual mission trip to the Dominican Republic, or even assisting Cabarrus Family Medicine’s sports medicine physicians at the area’s local high schools. It’s all designed to instill residents with a strong sense of community and the importance of giving back. Blessed with access to remarkable facilities, including the Copperfield Room, CFMR is hosting the two year I3 Population Collaborative. This event brings together 23 family medicine residency programs from the Carolinas and Virginia to discuss ways to improve quality of care, patient experience, and population health. As part of the event, second-year Cabarrus residents presented their work they are doing regarding improving the overall patient clinical experience. Events like these demonstrate how Cabarrus works to engage its residents in its important health initiatives with the added benefit of showing them how it all comes together - from planning, research, to implementation. Cabarrus residents are plugged-in, build key relationships in the medical community and carry both with them into community practice. In addition to its Concord clinic (pictured on p.9), the Cabarrus residency program operates three additional outpatient sites in Kannapolis (top), Harrisburg, and Mt. Pleasant. All in-patient training takes place at CMC NorthEast Medical Center, a 475-bed community hospital. are available that describe this process, review the new system, and outline what practices need to complete. Instructor-led Training (ILT) will be held in five locations across North Carolina through June 20, 2013. Detailed instructions for “How to Register for Training”, as well as an NC Tracks Training Tool Kit (including the ILT schedule) are available on the OMMISS Communication website at http:// ncmmis.ncdhhs.gov/communication.asp. Please don’t delay! one of the reasons I avoided giving to the PAC in the past was the lack of control I had on where the dollars went. But the truth is, you can get behind the wheel. In the next few paragraphs I am going to explain how you can fix that little problem and get some control! Wednesdays. In February of this year, we had a great group of 10-12 family doctors and students who attended hearings on mental health funding, met individually with legislators, and worked together to help spread the message of the importance of CCNC in our state. This was a powerful day of advocacy. I would love for our next White Coat Wednesday on May 22nd, 2013 to turn out four or five times that number of docs. Yes, it means blocking your schedule, driving, getting behind on EMR and email for a few hours. However, I would argue that the time is well spent and as you leave the day you feel a renewed sense of connection to your specialty society colleagues, but also to those men and women who have been charged with the responsibility of setting our policy and laws in NC. Taking the time out of your schedules is a very generous gesture that is clearly recognized in the legislature. I don’t think I am being naïve when I say many of our legislators look forward to our visits and our insights into matters that affect the health of our state. In case I haven’t been clear, the charge I am making today is this: make a new habit of making it a priority to contribute to our PAC every year with consistency, involve yourself and your voice in the councils of our Academy, and take a day to join your colleagues in the legislature on White Coat Wednesdays. Whether student, resident or crusty old family doctor, each of us has stories to tell and knowledge to share that our lawmakers rely on to make good decisions for our state. When you do these things, you are not only doing them for our specialty but for the good people of our state. Consider this your formal invitation to a great date--- can’t wait to see you on May 22nd! your messaging and if you have an example from your practice where some aspect of CCNC, such as the efforts of the care managers, made a difference in the lives of your patients, tell it to your legislator. If you accept Medicaid in your practice, the proposed changes to Medicaid WILL affect your practice on multiple levels and even if you are an employed physician, it will ultimately affect the reimbursement you receive as well as the requirements for seeing these patients. If you have contacts with the Governor or one of his staff members, do not hesitate to also reach out to them with our message. The Governor was elected with the support of many members of the medical community. And while we applaud many of his goals, we disagree with the roadmap he is taking on Medicaid. As opposed to out-of-state managed care bureaucrats, we believe North Carolina’s physicians are best equipped to continue to improve the care of North Carolina’s patients. We’ve worked together to take CCNC this far, and it’s the envy of the nation. Now is not the time to throw out what is working right in our state.